The Natural Resources Department’s low-pesticide-usage honeymoon is over, judging by the pesticide usage data from the first half of 2018. If this continues in the second half, NRD will end the year at nearly the level of pesticide use in 2013. 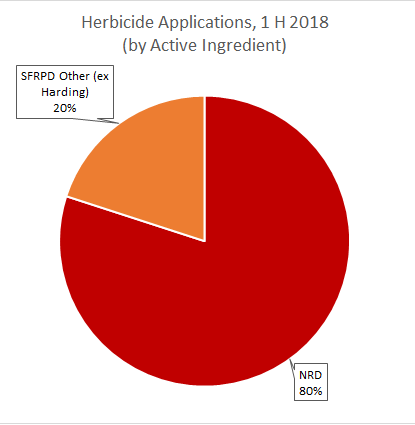 The NRD accounted for 80% of the herbicide use (calculated by active ingredient) and for 85% of the applications in Jan-June 2018. 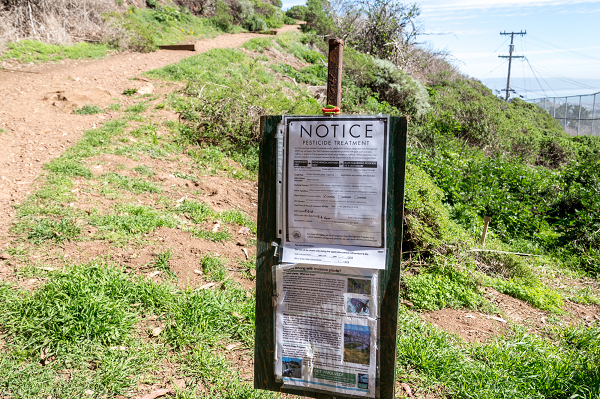 The NRD, which is responsible for the “Natural Resource Areas” of San Francisco’s Recreation and Parks Department (SFRPD), is the largest user of herbicides in SFRPD (barring Harding Park, which we exclude because the golf course is managed under contract with the PGA Tour). NRD is the only user of Garlon in SFRPD, which it uses only on yellow-flowering oxalis. In six months of 2018, it had already used more Garlon than in any whole year in the last four years. (That’s the orange column in the chart below.) Garlon is the worst of the “reduced risk” herbicides. It’s Tier I (according to the SF Environment rating system, where Tier I is “most hazardous” and Tier III is “least hazardous.”) and has been listed as “HIGH PRIORITY TO FIND AN ALTERNATIVE” for at least a decade. The use of Roundup (or Aquamaster) dropped in 2016, after the WHO declared glyphosate (the active ingredient) a probable human carcinogen and SF Environment moved it from a Tier II to a Tier I rating. (See: Roundup Probably Carcinogenic) But it’s rising again. If the second half is as bad as the first half, glyphosate use will exceed 2017’s, which was more than double the amount used the 2016. NRD uses four herbicides: Garlon (triclopyr) the most hazardous, which is Tier I; Roundup/ Aquamaster (glyphosate) which was re-rated to Tier I in 2015; Polaris/ Habitat (imazapyr), a pesticide whose breakdown product is a neurotoxin, and is persistent and mobile in the soil; and Milestone VM (aminopyralid), which is even more persistent and can remain active for years and keep poisoning the soil. Its usage of all four has risen, if we prorate the half-year usage figures. SFRPD is has added three new herbicides: Axxe, Lifeline and Clearcast. The last two are on the draft “Reduced Risk” list for 2018, though the SF Environment website says the 2017 list is still the current one. SFRPD has been using Clearcast in lakes in Golden Gate Park (GGP Nursery) against water primrose and parrot feather plant. Lifeline has been used once, on the hardscaping in Golden Gate Nursery. Axxe, which is a Tier II pesticide and is actually on the 2017 list has been used a number of times. In the Natural Areas, it’s been used on Twin Peaks against oxalis (that’s the “Other Tier II” in the column chart above). 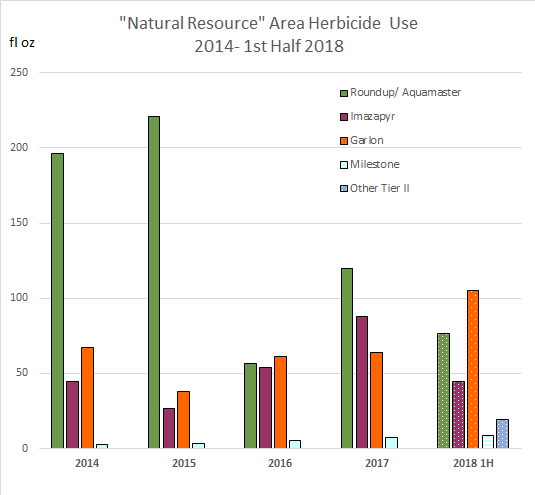 While we are glad that SFRPD has moved so strongly to reduce herbicide use (at least in non-Natural areas), we’re disappointed that it continues to consider pesticides a viable strategy. We would like to see SF Environment take the leadership in moving San Francisco to a policy of No Pesticides in our Parks and Watersheds.